Members of the San Francisco 49ers kneel with teammates during the national anthem before playing the Washington Redskins at FedEx Field in October. It leads to the idea, says Amira Rose Davis of Penn State University, "that 'you are good as entertainment, but once you have a voice, I don't want to hear you. You need to shut up and play.' "
Some players, though, clearly are not satisfied to just play and be paid. This week, at the end of two days of meetings with owners and players, NFL Commissioner Rodger Goodell explained at a press conference that the league would be working with players on their interest in issues that affect their communities. Goodell said the league handbook would remain the same: It is policy that players stand for the anthem, but it's not a rule. "We want our players to stand; we'll encourage our players to stand," Goodell said. He would not answer questions about what happens if individual owners choose to discipline their players if they take a knee. "I'm not dealing in hypotheticals right now," he demurred. Owners anticipate more fan anger and more White House tweets. The controversy could be a watershed moment for the NFL and the sport. And the stakes are high. "Sport has often been a site for not only the expression of tensions in society, but it's also been a laboratory of sorts," says Davis, an African-American assistant professor of history who studies gender, race and sports at Pennsylvania State University. "This is an arena that is very visible," she adds. "And if you can discipline a black body in this space, it sends a message to disciplining black bodies across the country." You know the history of this: Then-San Francisco 49er Colin Kaepernick took a knee last year while the national anthem was being played. Despite what critics say was intended by owners to be a chilling cautionary tale, more and more NFL players (most of them black) have joined Kaepernick in taking a knee this year, and America is not happy. Well, a lot of white America is not happy. And that is an important distinction. Facebook videos show angry white men throwing their team jerseys, caps and posters in a pile and setting them on fire. Via tweets, President Trump is urging fans to boycott the NFL until it orders its players to stand during the anthem: "total disrespect for our great country!" Many owners, initially offended at Trump's directive, have changed their tune. The dispute comes as attendance and television viewership for the NFL have been sliding. And while it's unclear what effect the protests might be having on this, it's pretty clear the league is worried. Dallas Cowboys owner Jerry Jones, who linked arms with his team two weeks ago and took a knee before the anthem, has now promised all his players that anyone protesting while the anthem is being played will be benched and fined. Maybe worse. All this doesn't surprise Colorado College historian Jamal Ratchford. He is African-American and studies the nexus of sports, race and protest. "Self-determination of black athletes has always been a challenge and infringed upon," Ratchford says. Think Muhammad Ali, who protested the Vietnam War by refusing to be inducted into the military. He was stripped of his title, fined and banned from boxing. Or Tommie Smith and John Carlos, gold and bronze track medalists respectively, who stood with upraised fists as the anthem was played during the Olympics in Mexico City in 1968. They were stripped of their medals, and upon their return home, Carlos was under FBI surveillance for years afterward. There were death threats, public shunning. Davis believes a lot of spectators aren't interested in athletes' political opinions. She adds that the kneeling protests as the anthem is played are being conflated with disrespect for the flag and the military; she believes the conflation is erroneous — and purposeful. Especially when it's used by prominent critics, like the president. "Not about the flag or the troops"
The bended knees aren't about the flag, Davis says. "This is about police brutality. This is what we experience as black people in America. This is not about the flag or the troops." Davis notes that over and over, athletes have made that point. "They've penned op-eds, done town hall debates and talked on news shows." What the anger is actually about, Davis believes, "is what happens when black bodies don't conform to what white spectators and consumers want them to be or do or say." Jeffrey T. Sammons agrees. Sammons, an African-American professor of history at New York University, has looked at the role that race plays in boxing and baseball, among other sports. He believes football in particular has always had a militarized veneer: the playing of the anthem, the color guard that bears the flag on the field, the flyovers of fighter jets at some games all contribute to that. "And there is a level of conformity that's imposed upon our athletes, who are supposed to be sort of like weaponless warriors." Players — especially black players — who don't conform are often criticized for being "spoiled, rich, undeserving brats." What is often lost in the noise, Sammons says, is the fact that these "brats" are earning their lofty salaries for a few short years, while the injuries accrued during that time have lasted many for the rest of their lives. All three historians note that the money the players make is infinitesimal compared with what owners reap from their labor. The implications of all this go far beyond football. Ratchford says the protests have been valuable as a tool to raise public awareness, but he is wondering about the long term. He believes a collective effort to address grass-roots concerns in black communities might be more effective than the kneeling demonstrations. The league's announcement this week that it will work with players on some of their social justice concerns may be a step in that direction. Bottom line: The fans want their game back. The owners want full stadiums. 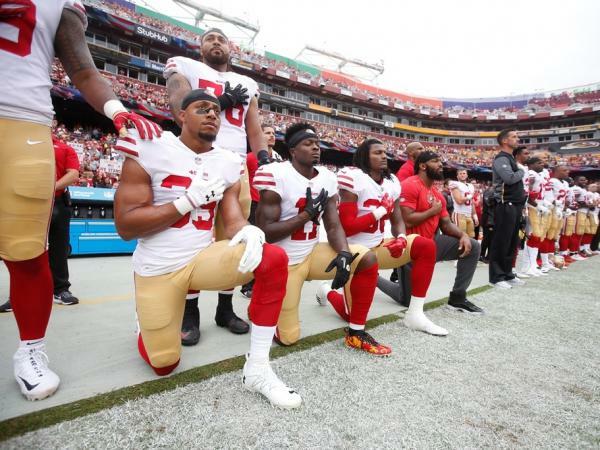 The players want their right to peacefully protest police brutality and racial injustice. Given those widely disparate interests, it's going to take skillful negotiations to bring these parties together. This week's meeting between players' reps and NFL owners may be a start. Ultimately, the question may boil down to this: Who decides when, and how, players — especially black professional athletes, who are all too aware that some of their ancestors actually were owned by others — can exercise their right to self-expression?